File Size: 11.0 MB, Duration: 23' 40"
In this month’s edition of the podcast we look at seasonal gardening jobs to do in the garden during the month of December and a selection of plants that look good in the garden at this time of year. Review of the Year's Podcasts - 01' 11"
As the last episode of the year, we take the opportunity to re-cap on the previous podcast episodes through the year, highlighting some of the plants we discussed and people we talked to in the podcasts. 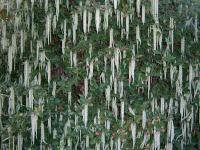 Plant of the Month - 10' 23"
Our plant of the month for December is Garrya elliptica 'James Roof' – Silk Tassel Bush. This shrub produces interesting flowers when many other plants are beginning their winter dormancy, flowering from December through to February. The silvery flowers are catkin-like and very long, up to 20cm in length and hang down amongst the evergreen, holly-like dark glossy foliage. Jobs in the Garden - 12' 32"
Everyone loves to see the stunning foliage of a Poinsettia at Christmas time, but to ensure that your Poinsettia has a stress free Christmas, keep it in a room that is neither too hot nor too cold; about 16°C (60°F) is perfect. Whilst your Christmas Cactus is flowering, water it a little more than you would at other times of the year. 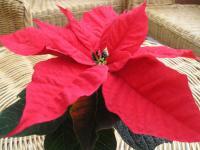 As with the poinsettia, a room temperature of about 16°C (60°F) is fine. If you want a Christmas Cactus to flower year after year, put it outside during the summer months in a shady location. In the Vegetable Garden - 15' 13"
Plants of Note - 15' 52"